The Arduino YUN. YUN means cloud. For the longest time, the creators of the Arduino have been looking at how to bring the Arduino platform into the cloud. Ethernet and WiFi shields technically work, but if you’re processing data scraped from a web page, a lowly microcontroller really isn’t the best option. Enter the Arduino YUN. At its core, it’s a regular old Arduino Leonardo. Underneath that metal plate on the board? That’s an SoC running Linux. Basically, the Linux side of the Yun is pretty similar to a WiFi router running OpenWRT. There’s a USB port for plugging in peripherals, native WiFi support (802.11n, even! ), an Ethernet connector, and enough RAM to do all the interesting stuff a small computer connected to the Internet can do. To make all this web programming easier for Arduino neophytes, the YUN also includes a ‘bridge’ library that automates HTTP transactions between the Linux and microcontroller sides of the YUN. There’s also support for Temboo, an SDK for dozens of APIs that interact with Facebook, Dropbox, FedEx, and hundreds of other web services. Below you can check out [Massimo] and [David] showing off their wares and going over how the YUN connects to the Internet and interacts with the microcontroller over the ‘bridge’. It’s an interesting device, and something we’ll surely check out at the World Maker Faire. We’ve seen some light painting before – waving a microcontroller and LED strip in front of a camera is a very interesting project after all. [Saulius]’ light painting stick is unlike anything we’ve seen before, though. 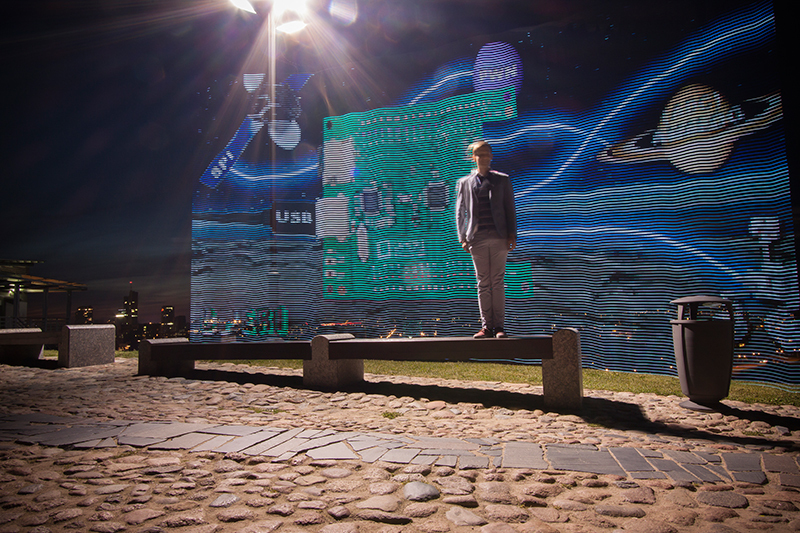 It’s huge – four meters high, and is also very flexible in the field, drawing images served up from a smart phone. 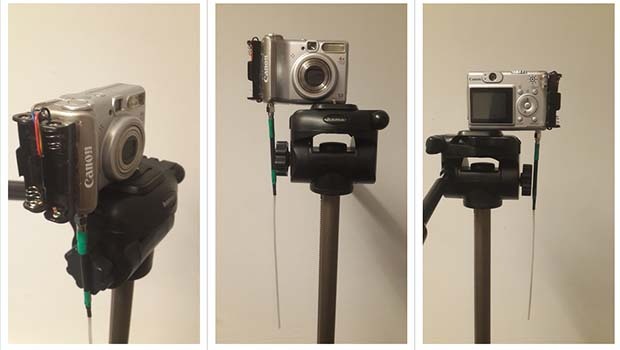 To get his pictures onto his light painting stick, [Saulius] used the very cool Carambola, an exceedingly small board that also runs Python. The images were converted to a 128xWhatever .BMP file served to the Carambola over WiFi with a smart phone, Since the Carambola runs Linux, sometimes a kernel interrupt would mistakenly restart the drawing process. [Saulius] found a way around that by writing the drawing code in C and wrapping that in a Python module. The speed of C and the flexibility of Python, who could ask for more. Greenhouse owners might find [David Dorhout]’s latest invention a groundbreaking green revolution! 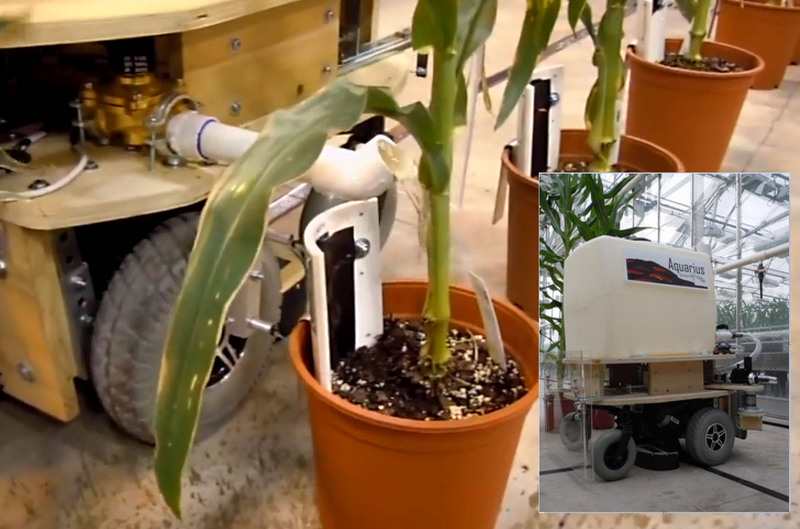 [David]’s Aquarius robot automates the laborious process of precision watering 90,000 square feet of potted plants. Imagine a recliner sized Roomba with a 30 gallon water tank autonomously roaming around your greenhouse performing 24×7 watering chores with absolute perfection. The Aquarius robot can do it all with three easy setups; add lines up and down the aisles on the floor for the robot to follow, set its dial to the size of your pots and maybe add a few soil moisture sensors if you want the perfect amount of water dispensed in each pot. The options include adding soil moisture sensors only between different sized plants letting Aquarius repeat the dispensing level required by the first plant’s moisture sensor for a given series. [David Dorhout] has 14 years experience in the agriculture and biotech industry. He has a unique talent applying his mad scientist technology to save the future of mankind as seen with his earlier Prospero robot farmer. You can learn more about Aquarius’s features on Dorhout R&D website or watch the video embedded below.